It is only in crises that we can know the real self of our best friend or associate. But we actually come to know this self not so much by what the person achieves outwardly as by the way he approaches an emergency, by the quality of his response to lack and defeat. In every one's life, a time comes when one is forced to realize that what one does, feels or thinks does not come up to the ideal of behavior, personal achievement and success which one has held. Even the most self-satisfied individual is aware of some lack; his self-satisfaction is ordinarily a screen behind which he hides a sense of unacknowledged inferiority, uncertainty or dread of failure. The real problem, however, is what does the individual do with this experience of defeat? How does he cope with the realization that he lacks strength, endurance, adaptability, technical skill or wisdom, refinement and the ability genuinely to love? How does he meet the realization of the necessity for self-improvement? How should he meet it so as to insure the best possible results? A person is seen in his true inner worth when he faces the experience of inadequacy, lack, frustration or defeat. When he is equal to the ordinary needs of the day and able to meet with fair poise what life and society (or his family) demand of him, we see only his abilities at work. When these fail or are inferior to their task, when his body falls ill or his mind is thrown off its normal sense of stability, then we see the person himself. It is only in crises that we can ever know the real self of even our best friend or associate. But we actually come to know this self not so much by what the person achieves outwardly as by the way he approaches the emergency, by the quality of his response to lack and defeat. If a person with great reserves of vitality falls ill and makes a spectacular recovery, if a nation with vast resources throws itself with great success into a program of enormous production when confronted with war or disaster, this does not of itself necessarily reveal the greatness of the individual's inner self or of the soul of the people. What counts spiritually is the quality of the effort — and what this effort creates in the person or the nation. It is the aftermath of victory that tests the spiritual quality of the victory. It is what victory does to the mind and soul of the victorious. The word "crisis" comes from a Greek word which means "to grow." Crises are opportunities for growth as well as challenges; but there is growth and growth! A man can grow bigger and fatter, wealthier and more self-important. Does it make him better able to meet the next crisis? Does it make him come closer to a fulfillment of his true and essential purpose in life? If it does not, then it is only a false kind of growth. To grow is to become, actually and effectively, what you are in, potentiality, as a spiritual being, at the threshold of your birth. It is to achieve the essential purpose of your life as a whole — God's purpose for you, the religiously inclined person would say. The question is then: How can you best orient yourself to an oncoming crisis? If it comes unannounced (as does a sudden illness, an accident or death), what is the most basic power, function or drive which you should call into play in order to meet the emergency — and, what is more, to meet it so that you grow spiritually from the effort? Most people, obviously, do not stop to ask these questions and to find answers; it is well that they do not, at least at first! But when they grow older and realize that there is something quite wrong about the way they have approached their crises so far and dealt with their illnesses or sense of inferiority, then the time comes for finding out more about themselves and their innate abilities to meet these crises. Reorientation has proven to be necessary. New techniques, perhaps, must be learned — what is more fundamental, a new approach to the use of the skills one already possesses. This is where the idea of discipleship comes in. One may learn from written instructions or from an impersonal statement of what to do and the tricks of the trade. One may memorize exactly a set of responses — to a critical situation — for instance, what to do in a traffic jam when driving a car. This is technical knowledge; we, today in America, worship this kind of knowledge. But you may be a technically skillful driver and yet — through impatience, emotional recklessness or over-fatigue and nervous tension — cause a serious accident. The technique is there, adequate to meet the impending crisis; but your personal, emotional or physiological approach to the possibility of crisis may defeat your ability to use your technique. In some cases, a subconscious wish for failure or death may make this defeat almost compulsive. Discipleship, when properly understood, does not deal merely with the learning of a skill, but above all with being subjected to the contagion of example from an individual who not only has the skill, but is able to use it to the fullest in times of crisis. A student acquires knowledge from a teacher; a disciple receives from his master the power to transform his personal attitude to life, to himself and to God, so that he can use whatever knowledge he has — or whatever inspiration comes to him effectively and creatively. However, this power which the disciple receives does not come to him unless he qualifies for it. Therefore, he must discover the manner in which he can best qualify; this implies always some kind of preliminary reorientation. Before the disciple can actually receive the power to experience a true inner metamorphosis with the help of the master, he must desire to change and to grow. He must, be ready to serve and to obey, for true and eagerly accepted service is the only cure for egocentricity or selfishness. The capacity to obey and to take directions is necessary to the disciple if he is to pass successfully through crises which imply a challenge to the very existence of his ego, his dear ego. Because the sixth represents fundamentally everything that deals with personal crises and the way to meet them, it shows, more than any other factor in the whole of the astrological field, how an individual person can grow and become transformed. It indicates, by its contents, the basic type or types of challenges to be expected whenever opportunities to growth are presented. These are presented either simply by life itself or with the added assistance of the master and spiritual guide, whose task it is to make the opportunities more definite and, thus, the crises more focalized and acute — a point very well worth thinking about and remembering. In traditional astrological textbooks, the sixth house is said to refer to employment (either to servants one employs or to one's employer), to everyday work, to all forms of training, to matters concerning health and hygiene — and in specific cases to Army and Navy service. As usual, such traditional meanings, if considered in themselves, are superficial, limited and fail to reveal the basic significance of this most important house. This basic significant is that of personal growth. Growth means transformation or change of condition. This change requires taking a new step forward (or, if the motion is negative, backward); in every new step one takes, there is a moment during which the person is off balance, having left a previous state of equilibrium (or stability) and having not yet reached the state ahead. This off-balance state means a "crisis." All crises are transitions between two states or conditions of existence and consciousness. Most transitions are difficult or painful; hardly any man will pass through them deliberately and consciously unless he is made to desire the risk by a sharp or poignant realization that he lacks some skill, that he has (at least partly) failed or been defeated. Illness is either the direct result of some defeat of the vital energies unable to cope with a challenge to grow stronger or a way of the soul to impress upon the outer consciousness the need for a revision of attitude — or the normal sign of bodily disintegration in old age. It may also be imposed upon the body (or the mind) by the violent impact of some over-all social crisis, war or revolution. 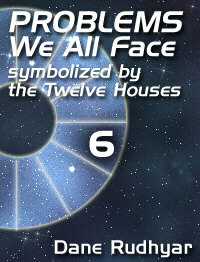 In the last case, however, the twelfth house is the main field of disturbance; the sixth house (its polar opposite) shows mostly the response of the individual to the social situation. One should not forget, however, that for the individual to respond to a social or national need is the normal way to grow; this normal way does not inevitably require that the individual pass through acute crises or experience illness. What is demanded of the individual is that he contribute to the productivity and the growth of his community; this contribution takes the usual form of employment or service. Such a contribution may well include, nevertheless, a multitude of small crises or of determined efforts at adjustment to social conditions — even if it be only daily commuting in crowded subways or the effort to overcome fatigue every morning as the alarm clock (the modern slave driver) whips one out of slumber! If the relation of individual to community is negative, employment means slavery, crude or attenuated; if one's society is torn by wars and revolutions, the field of sixth-house experiences means compulsory military service of some sort. Crises become sharper then, even if small and repeated. Yet they still can mean growth for the individual; the slave can demonstrate far greater spiritual growth than his ruthless master! What counts is the attitude taken and the degree to which the spirit within, the inner self, has been aroused and has been able to induce transformations in the total personality; this should include, at least to some extent, the transformation of the body's responses and the transfiguration of instinctual urges and desires. At the limit, the alternative is transformation or death. Death can be a very slow and gradual process to which the individual soul assents (or which it even induces) out of weariness or despair. Growth always means some type of transformation. The message of the sixth house is: Be ye transformed! No person with an emphasized natal sixth house should seek to escape or to refuse to hear this call for transformation. To conform is to accept a static condition of existence; it is to accept the inevitability of crystallization, the degradation of the living into the inanimate, the stone. All dynamic living implies transformation — the transformation of one's personality and one's creative contribution to the transformation of one's society and civilization. To be creative is to be a power of transformation; it is to use crises to the fullest so that they come to mean effective and successful metamorphoses. This is the challenge of all sixth-house experiences. How can you meet it with the greatest chances of real success? If we look to the birth-chart for an answer to this crucial question — or, at least, for a clue which would help in clarifying the problem and its solution — we must first of all study the cusp (or beginning) of the sixth house. The zodiacal sign on this cusp indicates the basic type of energy, quality of behavior or approach which the individual should use to the best advantage in solving the sixth-house problems. If the person's attitude to life is natural and spontaneous, he will tend to use the type indicated; but an individual's natural abilities are so often deviated or twisted by the pressures of family, of religion and of moral, social and cultural tradition that he loses his true, spirit-directed spontaneity and intuition. He faces crises and opportunities for growth, he approaches the problems of work and service not as an individual, but as a member of a family, group or party. Someone else or some intellectual and religious system conditions his responses at the most crucial times of his life — the moments of transition. If Aries is found at the cusp of your sixth house, for instance, you must meet the challenge of growth in a pioneer's way, as a creator of (relatively) new values. You are not going to grow by conforming to a past tradition, even though you must, of course, be fully aware of it and of its historical significance in yesterdays now gone. You should have the courage to go forth as a leader, to point out new directions of growth. You must pour yourself personality into your work. It is you, as an ego, who must first of all be reborn, for it is you — the individual — whom your society needs — but the real you, not the mask which your family and culture have carved in the image of old ideals. If Taurus is at the cusp of your sixth house, your approach should be different. It is the very substance of your personality which is to be transformed. You should tap the deepest roots of your being for power; your ability to use power is at stake. You are the alchemist who should learn to transmute lead into gold, earthly materials into solar energy. Take whatever materials you find around you and integrate them — or "transubstantiate" them, as Jesus did when he changed water into wine at Canna, then wine into spiritual substance at the Last Supper. The planet which rules the signs at the cusp of the sixth house will show, by its position in one of the twelve houses (and also, to some extent, by the aspects it makes to other planets), the "field of experience" in which the challenge to growth should be mainly focused or which will usually color the character of this challenge in its typical manifestations. The natal house in which the planet ruling the sixth-house cusp is placed will also point, in most case, to the location of these typical challenges and crises. In the sixth house, we should see the solution of all individual problems of growth and self-improvement. There one meets crises and passes through transitions which determine one's standing as an individual. There the true spiritual self of an individual is seen acting directly or unable to act. There the one proves oneself truly victorious or defeated by the quality of one response, as an individual, to illness, failure, frustration or apparent defeat.